Duke Foods Centennial Museum Exhibit. Historical Exhibit and 100 Year Celebration — Manufacturing | Greenville, S.C. In 1917 Eugenia Thomas Duke began making Duke Mayonnaise and her famous Duke Sandwiches out of her kitchen for soldiers. 100 years later her legacy continues shared now by both the C.F. Sauer company and Duke Brands. As both companies have continued to grow Duke Brands decided the timing was perfect to celebrate not only her local contributions but also incorporate the Centennial as part of the opening of their new corporate office just a walk across the newly named Eugenia Duke Bridge at Falls Park. As part of the Celebration with conducted extensive research using Greenville and Charlotte archives and taping Ancestry.com to build a virtual family tree allowing us to gain contact with family relatives. The Upcountry History Museum allowed us an opportunity to highlight the timeline of Eugenia and the evolution of the companies as they operate today. From marriage certificates to recipe books we were able to recreate a rich educational exhibit including video interviews and opening day tastings of a few of her famous salads and spreads. Using Duke Mayonnaise of course. 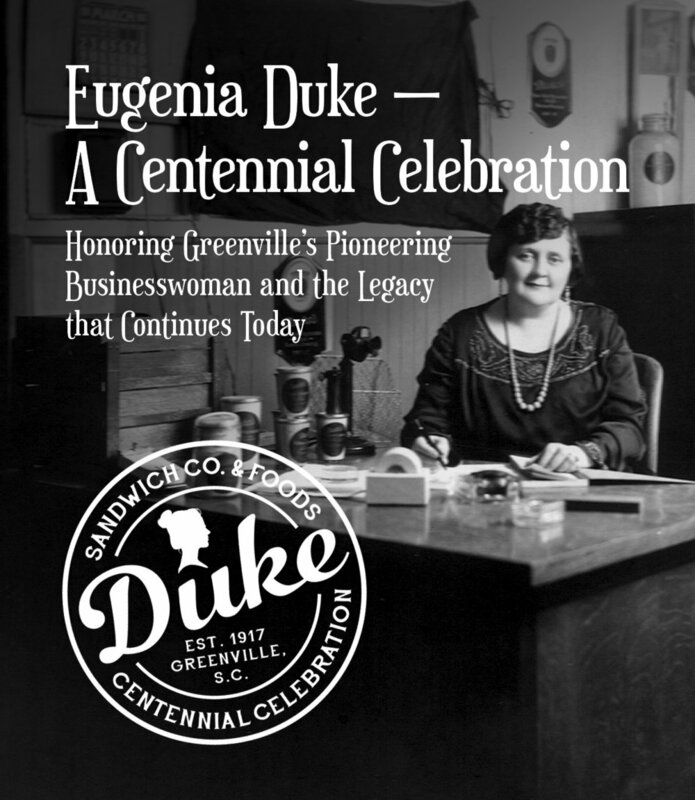 Celebrating the legacy of one of Greenville’s first female CEO. Along with renaming the walking Bridge over the Reedy River in the heart of downtown Greenville, a commemorative coin and a centennial poster, we celebrated with the opening of the new Duke Brands corporate office. We were honored to have her grand daughter and great grand daughter in attendance and know we made them proud to be an instrumental part of the ceremony. Thanks to the amazing assistance from Chad Patterson our campaign was born.